"We are so far into the field that the darkness has closed behind us, blotting out the road and the house. All we can see is alfalfa. Crickets make their racket and mosquitoes swarm around our heads, unable to believe their luck. We stand there in a starry, buzzing darkness complete as the end of the world." -Michael Cunningham, "A Home at the End of the World"
"I was so afraid to leave". It was like a nightmare, a nightmare in the middle of daydreaming. How far was it from Avenue de Paris to Waygand? I couldn't remember exactly, but it might have seemed as if it took hours from Corniche to the square. I might have come out of the sea and for the first time into Manara, clad in nothing but noise, but air. I wasn't walking, because I still heard the sirens, and smelled the glass entering my mouth; it wasn't a wound, but more like a safety belt, preventing me from screaming, preventing me from becoming; hence I crawled. The asphalt under my arms was made of silk, and though it seemed to me I had never seen the city, I knew exactly what I was going. Joyce writes in the Ulysses: "—Hello, Bloom. Where are you off to? —Hello, M’Coy. Nowhere in particular." How many times had I been here? I asked myself. The longer I had lived in the city, the less I could remember... It was all done on purpose. I didn't want to remember anything. Everyday I woke up to the same excitement, the same sense of possibility. I dragged myself through the same streets, re-enacting the same day again. I made pictures of the same places, sat at the same place, jotted down notes, and greetings from far away on the back of postcards that I would later send to the same address where I had been living, on a steep hill near the ocean. I wrote down the names of the streets on a napkin and compared with a map already worn out after so many days of travelling. And I was travelling, I said, that is why I could not send my address to friends in other countries. I travelled back and forth through the same five avenues in Beirut, from Ras Beirut to Saray, everyday, since the early morning. Why did I never unpack my suitcase, or buy a flower pot? I kept asking. I only came to visit the city for a day, I said to myself day after day, for two years. I didn't know exactly which city it was, so I kept asking people the names of the streets, in case I would get lost one day. I wanted to get lost, but eventually gave up on the possibility; in order to get lost you have to know where you're getting lost from. 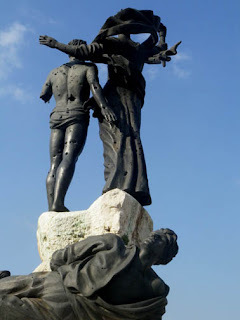 "Mafi 7ada 2a7la menak, mafi 7ada 2a7la menak..." I exclaimed when I crawled all the way, on the last day of my journey, to Mazzacurati's statue, riddled with bullet holes. The sky was orange and the streets were empty, adorned only with the noise. Suddenly I was dancing instead of crawling or moving, it was the 21st of February, 2005, it was like an ocean, splintering into streets and taking on the form of a man - the heartbeats, the limbs, the eyes... It was a fleeting moment, something I had rememebered, the day Samir Kassir died. But it was not 2005, it was not now. I still read his book, every morning, before going on my morning journey through the same streets, until the letters on the page were so worn out that they disappeared one day, and I was no longer able to read. Once, when I was in the grammar school I had learnt that Schliemann, the German archaeologist, had found the ruins of Troy in 1870, using Homer's Illiad as his travelbook. So I had felt about Samir, until he died, and the book refused to speak to me anymore. "The world is a book, and those who do not travel read only a page" was the commentary of Saint Augustine, even though he didn't love the world but God. Why would he want to travel in this book? Why would he love God instead of the world? I assume that the disappointment with the world always comes from a place of fear, and not from a place of love if we go by the quintessentially Christian assumption that the world will not last, that it's not durable and that is ought to pass, unlike the love of God, eternal. The rejection of the world contains in itself the promise that love can transcend the world, and that as long as the fear of loss remains, this love will be constantly unhappy: "Love itself is our death to the world, and our life with God. For if it is death when the soul leaves the body, how is it not death when our love goes forth from the world? Therefore, love is as strong as death." I was so afraid that I would never see the square again... Though so little remains of this heartland, only a music store and a wounded statue. "We are displaced people after all..." is what he said, when I told him that perhaps there was no home to be had if it had been lost once. I guess that being at home, in the world, implies that we have constituted it as such, and that we're readily aware that it will not last, other than as the promise of the selfsame constitution. If we're unable to keep our promises or receive them from others, then the world has vanished, there is just every you, every me, scattered limbs, tilting heads, up in the air. And why are these promises usually tied to places, since by logical necessity it is obvious that the earth will last and that we will not? February 21st, 2005, said a young woman: "La révolution a été prise en otage. Ils ont même pas eu de respect pour nos martyrs Samir Kassir, Gibran Tueni et d'autres resterons à jamais dans nos mémoires. Idem pour‪ Nassib Lahoud‬, mais pas les autres. Moi je les ai déjà oublié. La Révolution du Cèdre a été l'œuvre de vrais héros, mais l'œuvre a, hélas été récupérée par des zéros!" It seems as if promises and remembering and home are part of the same process. The hardness of faces, like rock. She tried again on the ninth of Av. By wind and white dust. But she'll try again and again." When will Beirut try next time? That was the question on the basis of which I could never unpack my suitcase. And so vehemently I had wanted to go home, without God, I didn't want a part in the kingdom, or a slice of eternity or identity. Why should I have such loyalties and accept such dictates? And so tired I was, from reading only page from the same book, having lost directions, so haunted by the fear of loss. How could I dread losing a place I never had? How could even places be had? It seems to me as if time is a much stronger index of human life than space, since human bonds happen in time, and restricted by time, under the assumption that life isn't a durable good and that the end of lifetime is the end of life in general.